This method provides appropriate opportunity for the development of imagination, discussion and thinking power of the children. This method can give more help in the creative work. A child himself is always ready for acquiring the knowledge after searching by this method. The knowledge which he gets in the special condition, he arranges that generalization in his mind properly. And this process helps him in the learning. For example- after eating the green unripe mango, he knows about the generalization of mango, that all the green unripe mangoes are sour. This method has proved more useful for math, science. In resolving new problem of math, he uses new ways and formula by his insight. Insight method is necessary and more useful in the research works of the higher level of education. A teacher should present a complete problem in front of student, as—in the geometry complete problem should be presented not formulas. A teacher should keep in mind the rules of readiness for the successful use of this method and student should always be prepared for grasping the situation. A Student should be inspired by the teacher for the learning till then he does not get the solution of the problem. By the effort of teacher, curiosity and interest develops in the students. So it is his duty that he develops the interest and curiosity in the student in this type of learning. This theory forces on the organization and completeness of experience, so teacher should help the student in the reorganization of the experiences. 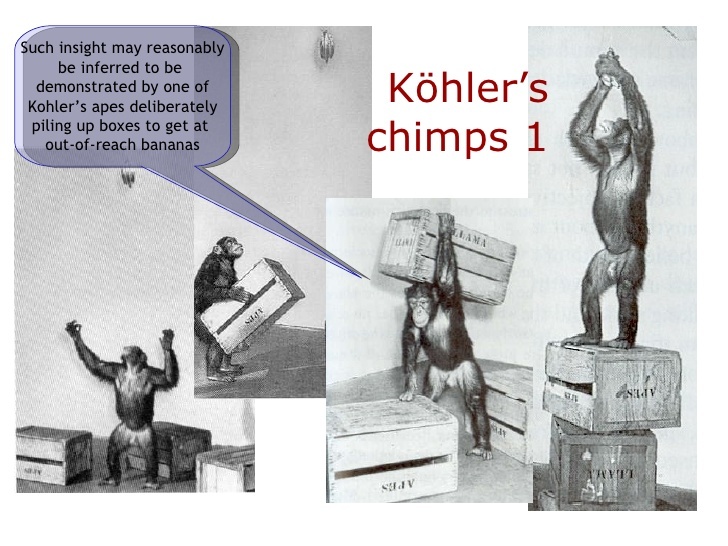 Kohler’s Insight Theory depends on the concept of Gestaltist. Kohler himself had a distinctive place among the Psychologists who developed Gestaltism. The founder of Gestaltism was Max Wertheimer. It is necessary to understand the concept of Gestaltism for the understanding of Kohler’s Insight Theory. The meaning of Gestalt is whole form. Gestaltism means the concept of presenting the whole form as a figure. Kohler’s insight theory depends on the thought of Gestaltist. Gestaltism means, the concept of observing any figure completely or entirely. A Student should be inspired by the teacher for the learning till then he does not get the solution of the problem. By the efforts of the teacher, curiosity and interest develops in the students. So it is his duty that he develops the interest and curiosity in the student in this type of learning.